Ok, so sports games don’t appeal to everyone, and football games in particular. 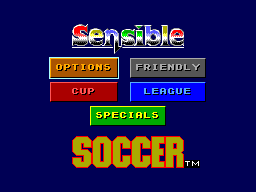 Sensible Soccer is not like California Games where it may appeal to all gamers with a huge variety of different gaming delights hidden within the cartridge. To put it bluntly, it’s football… or soccer if you will… But don’t let this fact sway your decision in whether or not to purchase Sensible Soccer – read on before making that choice. The game does have shortfalls, however for those familiar with the term ‘synergy’, it just works! There are friendlies, leagues and cups, and even the ‘special’ teams. They may not sound funny, but when you have Doris passing to Mavis to score an amazing 25 yard volley it is! In the game you feel it takes skill to win. No other football game for ANY system touches Sensible Soccer in terms of gameplay. 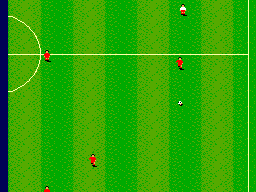 The graphics in Sensible Soccer are basic. BUT… don’t let that fool you, basic doesn't = bad. Basic = the SMS version of the game followed EVERY version. Ok, each player resembles a lego man, but if you take this as a fault you just don’t get it! If you look at the way the graphics are incorporated, what you’ll find is that the players all move very smoothly, with no glitches, the scrolling is smooth, and the ball when kicked actually does move how it should. This is the one area that lets the game down badly. When the game is loading, a great toe-tapping tune blasts from your TV, but then the game starts and you have approximately no music and six sound effects before the final whistle. There is a crowd roar, referees whistle, and dull thuds when the ball is kicked or hits the post. A few more sound effects or a tune, say after a goal, would have been nice but then maybe my expectations are a little high. The controls for this game are second to none. You tap the ball to pass, hold it a bit longer for a bigger pass, and the other button to shoot! After a while you’ll realise that you can ‘bend’ the ball in the air using the D-pad. If I had to gripe about anything, on the odd occasion you'll find yourself an inch from the screen screaming that you were not pressing the D-pad in that particular direction. But again… maybe that’s just me! I have had this game in my collection for twelve years, and I keep going back to it. I don’t believe, if you like this particular genre, you will ever tire of Sensible Soccer. There is always another league title to win, and playing it in 2 player with a mate is always good for a laugh. Sports and football games may come and go, but Sensible Soccer is here to stay! Sensible Soccer is one of a few SMS games that simply isn't dated, it hasn’t aged a day (I mean metaphorically before anyone starts!!). This is mainly down to the games’ creators who deliberately took a basic approach from the start. Look beyond the simple graphics and sound effects and you’ll uncover a gem. If you’re a lover of the genre, GET IT! And if you’re not a lover of the genre….. GET IT ANYWAY! You’d be scoring an own goal (get it?) if you don’t!